Exclusive use is included with overnight entire Facility Rental south side of the creek: 24 hour use of Pavilion, Cedar Country Cottage & Lone Oak Room, Trails End, Woodview, Rebecca's & Del's cabins. 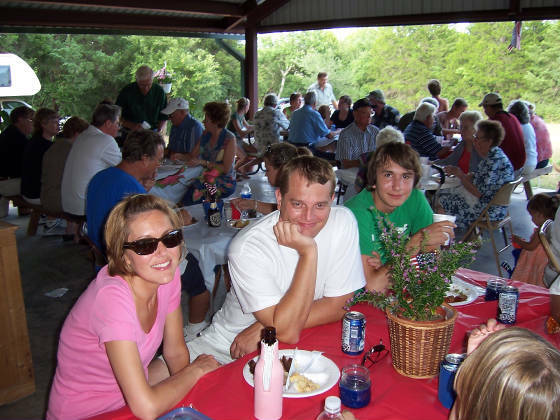 Although all our cabins have individual grills, our overnight guests are welcome to use the outside area of our Pavilion which has extra picnic tables and patio tables, a serving bar, a large outdoor stainless grill, & beverage coolers. Please read our rules posted on this website and ask for our event pricing package. The large 32 X 32 covered area features two ceiling fans and plenty of electrical outlets for music and catering needs. Note two serving bars. When the cool season arrives, there's a chiminea to warm your hands and/or firepit plus a fireplace is on the way in the future. There are men's and women's restrooms each with a shower for getting ready for that special event or for tent campers. This picture was taken on April 20, 2014 on Easter Sunday. It shows the playset for the kids that Betty & Del built. It is very convienient to the Pavilion so guests can watch their kids play while enjoying themselves in the shade. There is a tiny tot sandbox on the other side of the Pavilion. 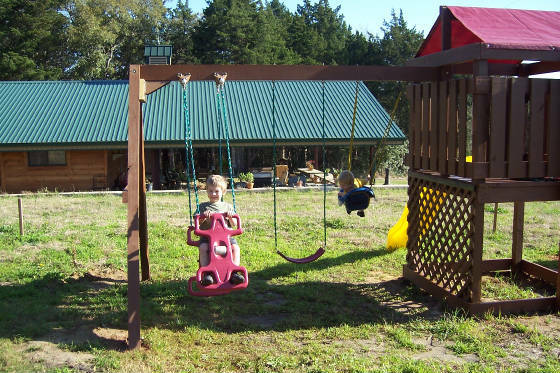 Horseshoes, frisbees, croquet, football are some games played on the grounds enjoyed by our guests. **Prices not applicable during Antique Festivals. We can help you with party planning, caterers, florists, tent and extra chair rentals. For more information please contact Betty Meischen. Send us an email !! Tell us what you need for whatever party you are planning and we can point you in the right direction. We have extra chairs, card tables, lots of props and materials available for decoration too. Betty & Del with Max enjoy the first fire on September 25, 2010 during the Fall Antique Festival. Pavilion Kitchen. Shown is the double oven and counter which has windows that pass through to another serving bar outside. The Pavilion kitchen has a refrigerator, range, microwave and serving counter. It also has a stereo/speaker system. It has men and women's bathrooms, each with two stalls and a shower. ** FOOD FOR THOUGHT! Get a bunch of your friends together this fall/winter/spring and have a campout and party around the campfire! Plug in your IPOD or put on a CD on our sound system, or hire a D.J. or bring your guitar and sing a song or two. ** We can direct you to catering companies if desired. Need some special touches? Just ask! We are there to help you have a successful party, reception or reunion. RELAX & ENJOY the serenity and tranquility of our woodsy little paradise. Our Lousianna friends have been coming to Trails West Retreat to the Antique Festivals for years now. They love to cook scrumptous meals at the Pavilion. 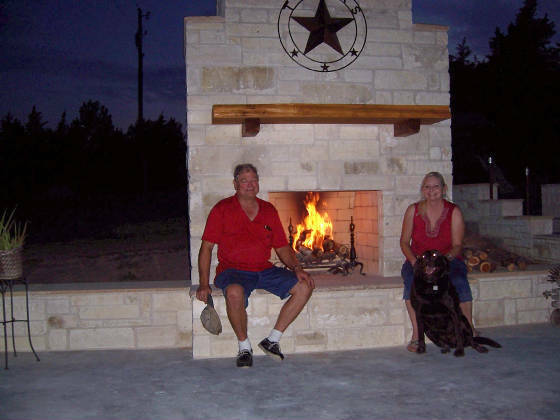 In Sep 2010 they really enjoyed the christening of our new outdoor fireplace. Our Son Scott & wife Desiree enjoy a bbq meal at Betty's 60th birthday party. In February of 2011, the Texas Medical Center Orchestra performed at Festival Hill. Some of the orchestra members stayed with us at Trails West Retreat. After the performance, we had a small reception for some of the orchestra members on the Pavilion patio including piano soloist Frank Levy of San Francisco. Violinist of the Texas Medical Center Orchestra with pianist Frank Levy and our neighbor and architect Bernardo who owns a theatre in Quito, Equador.